It was Dr. John Rengen Virapen who said that “the pharmaceutical industry do nothing but annihilate the population” of this world, a gross violation of the most basic tenet of all medical practice, i.e. first, do no harm. Yet, even the CDC website admits that among the common ingredients in all vaccines are: aluminum, mercury, formaldehyde, fetal tissue, live “attenuated” virus, etc. Just what exactly is “live attenuated virus” means? If they could attenuate live viruses, why can’t they kill them outright? Why can’t they kill the HIV, and Ebola viruses without killing the host? That is harmful science they are using. The rest is media acrobatics to project the illusion of safety and support unsubstantiated benefits from its use with screen actors. The prevailing reality is exactly the reverse of what’s been claimed. Those who have participated the biggest scam in the field of medicine have financially benefited the fruits of their own lies and deceit, but not Dr. Andrew Moulden. He was killed trying to inform the world about what he discovered regarding the true intent of injecting vaccines into the Sheeples. During those years, he showed that many cases of Shaken Baby Syndrome were actually vaccine-related damage. 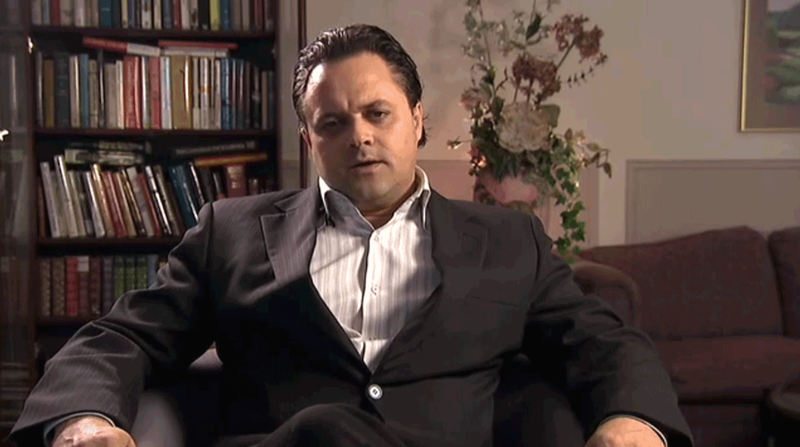 His testimony freed many parents from false accusations that they had abused their infants. Even before Dr. Moulden retreated from public view, a group of professional character assassins went to work to destroy his reputation in any way possible. They published lies and deceptions on the internet and did everything possible to bring him down. After he retreated, his websites were hacked and access to his teachings was largely destroyed. Yes, there were even death threats. 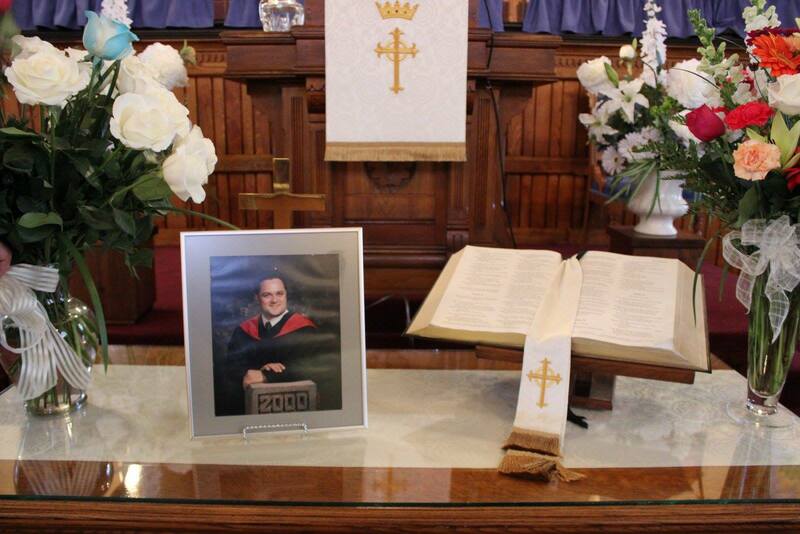 The death of Andrew Moulden is shrouded in mystery. Some sources say he had a heart attack and others say he committed suicide. A colleague of Dr. Moulden who wishes to remain anonymous reported to Health Impact News that he/she had contact with him two weeks before he died in 2013. Dr. Moulden told our source and a small number of trusted colleagues in October of 2013 that he was about to break his silence and would be releasing new information that would be a major challenge to the vaccine business of big pharma. He was ready to come back. Even though he had been silent, he had never stopped his research. Then, two weeks later, Dr. Moulden suddenly died. Dr. Moulden was about to release a body of research and treatments, which could have destroyed the vaccine model of disease management, destroyed a major source of funding for the pharmaceutical industry, and at the same time seriously damaged the foundation of the germ theory of disease. In another case of vaccine damage cover-up, Dr. Garth Nicolson received death threats. He was part of a research team that became aware of biological warfare testing that was done on prisoners in Texas. The biological warfare agents later showed up in vaccines that were given to US service personnel during the Persian Gulf Wars. The result was thousands of cases of Gulf War Syndrome and vaccine-related deaths. Professor Emeritus Garth L. Nicolson, PhD, is the President, Chief Scientific Officer and Research Professor of Molecular Pathology at the Institute for Molecular Medicine in Huntington Beach, California, and has taught in medical schools in the US and Australia. He is one of the most often cited scientists in America today. The powers who wish to suppress the work of Dr. Moulden have done a very good job of erasing most all of the information that was once available on the internet. Before it all disappears, I would like to take the time to summarize some of his teachings. In this article, and in those that follow, I will condense the key points from the 6 hour video series called “Tolerance Lost.” At the moment, this is still available on YouTube.com. The information was given in three videos, which are presented on YouTube in 51 segments. If you want to hear Dr. Moulden explain his findings, then I highly recommend spending the time watching his videos. The images of vascular and brain physiology are very instructive as are the numerous photos of children, Gulf War veterans, and other adults who display visible signs of vaccine damage. I have also used various other resources for preparing this summary. There are a few transcripts of interviews given by Dr. Moulden and three chapters from an unfinished book  that are still available on the internet. Text was collected and summarized from all of these sources. In some cases I needed to do additional research to fill in the details that were not fully explained by Dr. Moulden in these resources. My independent research also confirmed the facts of blood physiology and neurological functioning that Dr. Moulden described. Most people, myself included, were taught that every disease has a single cause. Thus, if we want to prevent that disease, then all we need to do is eradicate the cause of the disease. Once we do this, then the disease will disappear from the face of the Earth. According to this theory, if there is a disease, then there must be a single cause, which could be a bacteria, virus, parasite, or some type of environmental exposure. We might not understand the process of how a microbe, for example might cause illness or death, we only need to be reasonably confident that the microbe is associated with the disease. 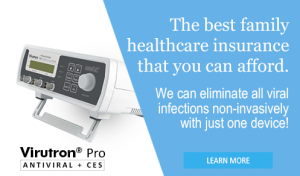 In other words, germs cause disease and we can stop the spread of infectious diseases through the use of vaccines, which are supposed to give the body immunity against experiencing disease. In theory, vaccines create a situation in the human body where exposure to a disease causing pathogen no longer triggers the disease. The vaccine era that started in earnest in the middle of the 1800s was a direct outgrowth of the belief in the germ theory of disease. The vaccine movement took a giant leap forward in the late 1950s after the so-called polio epidemic supposedly threatened the lives of thousands. The high visibility of the epidemic in the media produced great fear, which made Americans eager to take the polio shot and eat the vaccine-laced sugar cubes as soon as they became available. We were told that we should be proud of the dedicated researchers and their American ingenuity which led to the creation of the first polio vaccine in the 1950s. Whether or not the polio vaccine was effective and whether it actually caused more deaths than would have been caused by the wild polio virus is still hotly argued. But one thing is clear, the marketing of that vaccine caused Americans to become believers in the health preserving power of vaccines. Dr. Moulden challenged the single cause germ theory of disease. He, along with a select group of other physicians and scientists, recognize that we can no longer think in terms of a single germ causing a single disease. The modern epidemic of syndromes and diseases that began to afflict us in the last half of the twentieth century, and continues to afflict us today, are the product of multiple causes that work together to bring about disability, disease, and death. The multiple causes produce multiple illnesses and syndromes. Many, in fact most all, physicians and scientists still cling to the single cause single disease way of thinking. The pharmaceutical industry develops its drugs in the same way. Every problem, every illness, every disease can be treated by a specific substance of their creation. Of course their treatments rarely cure disease, they just treat symptoms. When the symptoms disappear, then the problem is resolved as far as they are concerned. Dr. Moulden rejected this way of thinking, because he knew that it was failing to cure people from what ailed them. It was based on flawed and ineffective medical science. He chose not to stay within the confines of mainstream medical thinking, but insisted on getting out of the box and looking deeper than most anyone else was willing to look. People who get out of the box are always criticized, attacked, and threatened by the established order, especially when a person clearly has more training and expertise than those who are doing the criticizing. Dr. Moulden had a PhD and a medical degree. His education focused on brain functioning and psychological/behavioral responses to brain dysfunction. He could see what other people didn’t see, because few people had his background or his tenacity to look beyond conventional medical diagnosis and treatment. He pulled together different aspects of science to create a comprehensive model of disease, which could explain numerous modern diseases. Based on his training and clinical experience, Dr. Moulden could not ignore the fact that vaccines were the greatest threat to human health in the twentieth and twenty-first centuries. He could not ignore it, because it was literally staring him in the eyes as he looked at the faces of his patients. He could see the evidence of cranial nerve damage caused by vaccines when he observed the abnormal facial expressions and movements of the eyes of those who had been exposed to vaccines. Dr. Moulden was convinced that the widespread use of large numbers of vaccines did not mark the beginning of a new age of disease-free living, rather they introduced a new era of universal sickness. Vaccine damage does not produce just a single symptom; rather the reactions are many and varied. Additionally vaccine reactions can occur shortly after receiving the injection or they can occur years later. Often, the reactions only become noticeable after many doses of different vaccines have been given. The variability in reactions and the unpredictable time frame for reaction gives the pharmaceutical industry and the medical establishment that they control, the statistical confidence to assert that vaccines do not produce harm. If they don’t see a large number of adverse reactions of a single type within a specific short time period, then they conclude that harm was not produced. 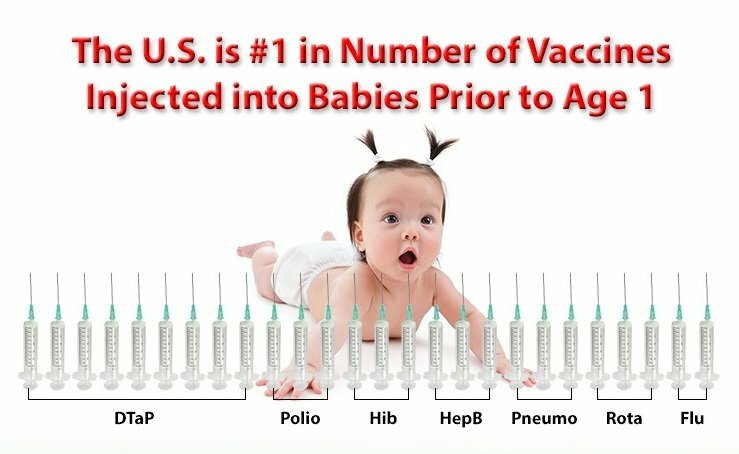 We are told that vaccines are so safe, that a child could receive 10,000 vaccines and not have an adverse reaction, yet the pharmaceutical industry has never done twenty-year longitudinal studies to even measure what happens to children who receive 69 or more doses of vaccine during the first 18 years of life. They have not done it and they will not do it, because they know that vaccine damage would be revealed. They also will never compare the health history of vaccinated children with unvaccinated children. It is estimated that one million children in the US have not received any vaccinations. So, it would be easy to compare vaccinated and unvaccinated children. But if this was done, the results would prove that vaccines do in fact cause illness, disability, and death. Dr. Moulden was convinced beyond a shadow of a doubt that vaccines do cause harm. He saw the evidence of disability, lifelong suffering, and premature death. Those of us who are willing to think outside of the box that has been created by the pharmaceutical industry accept the fact that vaccine damage represents a broad spectrum of conditions and syndromes, which can be traced back to vaccine use and exposure to various environmental toxins. Dr. Moulden understood that vaccines were a serious problem, but he also recognized that numerous environmental factors could also cause modern diseases. The combination of vaccine use, pesticide exposure, chemicals in food, toxic chemicals in the water and air, to name a few, are all working together to destroy our health, damage our fertility, and decrease the world population. He also understood that poor nutrition increased the severity of vaccine reactions. Dr. Moulden identified two primary mechanisms that explain how vaccines and environmental toxins cause the numerous neurodevelopmental diseases that have spread through the United States, Canada, and other so-called developed countries. The two components are M.A.S.S. and zeta potential. These will be discussed in detail in the next articles. At this time I just want to introduce you to M.A.S.S. (Moulden Anoxia Spectrum Syndromes). The damage to human health that occurs from vaccines and environmental toxins interferes with normal blood flow and triggers extreme immune system reactions. The result is oxygen deprivation at the microvascular (capillary) level. The capillaries are the smallest blood vessels in the body. It is estimated that the human body has 600,000 miles of capillaries. When blood flow is stopped and oxygen is no longer available to cells in certain highly sensitive areas, then cellular damage and normal body functioning will be damaged. When this happens in the brain and the digestive system, autism and other neurodevelopmental conditions can develop. Essentially, vaccines, certain environmental toxins, and poor nutrition can create conditions in which tiny strokes occur in microvascular regions of the body. Let’s start by defining the words that are in the acronym M.A.S.S. The letter M indicates that Dr. Moulden developed the principles that explain Anoxia Spectrum Syndromes. Anoxia is a condition in which the supply of oxygen to a group of cells or to an organ is absent. Anoxia is the result of restricted blood flow. Blood clots, inflamed blood vessels, and coagulated blood can slow or stop blood flow to certain areas of the body. When the blood flow is very sluggish, the flow can easily be stopped altogether or may momentarily reverse its direction. In this situation, oxygen cannot be delivered to cells and they begin to die. Cells literally can suffocate to death without oxygen. This is a key process for understanding how vaccine damage occurs. A syndrome is different from a disease, because it implies multiple causes and multiple symptoms. We tend to think of learning disabilities, autism, Alzheimer’s, irritable bowel disease, Crohn’s disease, colitis, food allergies, shaken baby syndrome, sudden infant death, idiopathic seizure disorders, Gulf War syndrome, Gardasil adverse reactions, schizophrenia, Tourette’s syndrome, chronic fatigue syndrome, fibromyalgia, expressive aphasia, impaired speech skills, attention deficit disorders, silent ischemic strokes, blood clots, idiopathic thrombocytopenia purpura, Parkinson’s disease, and other modern neurodevelopment disorders as being individual diseases that must have individual causes. However, if we step out of the box of conventional germ theory, where every disease has one cause, then it is possible to begin seeing illness and the recovery from illness in a very different way. Doctor Moulden brought these modern conditions together under the term MASS, because he could see that there were common mechanisms at work in all of them. Spectrum indicates that we are talking about a syndrome that ranges in severity or intensity. The symptoms of MASS can range from mild to severe. The disability from MASS can range from unnoticeable to death. The word spectrum also applies to syndromes across all age groups. The syndrome can involve babies in utero, infants, children, and adults of all ages. Exposure to the triggers of MASS also follow a spectrum. In some people, a small trigger produces a significant set of disabling symptoms. With other people, high amounts of exposure may only cause minimal changes in a person’s health at that point in time. However, the exposure to the triggers of MASS are cumulative, and it is common to reach a point after repeated exposures to one or more illness triggers where minimal exposure produces severe symptoms of disease. In some situations a point will be reached where the next exposure may become life threatening and may lead to death. The MASS reaction involves excessive immune system stimulation, causing immunological hypersensitivity. This condition is most commonly triggered by the insertion of foreign substances into the body that were never intended to be put there. Vaccines with their viruses, bacteria, adjuvants, preservatives, and unintended residual biological contaminants introduce many foreign substances into the body. The entire package of ingredients in vaccines, whether intended or unintended, will trigger an immune response. Vaccine manufacturers intend to produce an immune system response in order to achieve “immunity.” However, Dr. Moulden showed us that this immune system response has serious consequences, which threaten health and life itself. Technically, this reaction is called excessive non-specific immune hyperstimulation. This reaction produces definite harm in addition to whatever temporary small benefit (if any) that might be produced by the vaccine. Regardless of the trigger, the response of the immune system is the same. However, the visible symptoms of the damage that results from hyperstimulation of the immune system will vary considerably from person to person. These reactions have been classified as different modern diseases even though the cause for all of them is related to immune system hyperstimulation. This makes perfect sense when you consider that inorganic particles such as asbestos, prions (non-living proteins), heavy metals, and coal dust, by example, can all cause disease, cancer, disorders, and death. Yet none of these are germs. Clearly, it is something the body does in response to these foreign entities that is causing disease and not “germs and infectious diseases” in and of themselves. MASS is a generic physiological response. It does not matter that the infectious disease agents in a vaccine have been weakened, killed, or attenuated before they are placed in a syringe and injected into the body. The key point is that something foreign to the body has been injected into it, and the body is reacting in such a way that modern diseases result. The cure and prevention of human disease is to be found in understanding the body’s generic MASS response to foreign materials that enter the body. Dr. Moulden made it clear at numerous points that vaccines are not the only trigger for autism and other modern diseases. Vaccinations can be a direct cause of autism spectrum disorder in young children. However, vaccines given to mothers who are nursing their young children can lead to autism in their children as well. This means that a child does not need to be vaccinated to be damaged by vaccines. Dr. Moulden was trying to draw together all of the groups that are working hard to find solutions for their specific illness of interest, so that they could work together to stop vaccine use. He understood that the autism group, the sudden infant death group, the shaken baby syndrome group, the Gardasil group, the Gulf War Syndrome group, the attention deficit disorder group, the gastrointestinal problem group, etc., all need to be working together, because all of these illnesses are on the same continuum of illness. The symptoms of the illnesses may be different, but the mechanism that causes all of these modern syndromes and diseases is the same. As I continued to express and expound my concerns that the childhood vaccines were causally linked to autism and neurodevelopmental disorders, it came to a point that the regulatory powers in my professional life were convinced that there indeed was something wrong with me and that I must be in need of treatment to “get straight.” In essence, the College of Physicians and some of my colleagues, some of whom I have never met personally, to this day, asserted “Dr. Moulden is mentally unstable and in need of treatment” – he must be ‘MAD.’ I am — I was — I continue to be MAD. I AM DAMN MAD, and I have scientific proof of cause and effect on vaccine induced autism at the 99.99th percentile level of statistical confidence. That makes me MAD, in temperament, not insanity. Despite my unwavering belief in vaccine-induced brain damages (I could measure and see it), the College of Physicians and Surgeons own independent assessors could find nothing wrong with my mental faculties other than being ‘stressed.’ I was stressed. We are causing harm…nobody seems to care. Nobody wants to rock the boat. I just want the truth to be known so parents can make informed decisions and children and infants are no longer killed or harmed. Despite the College of Medicine’s own independent psychiatric assessors (there have been several) finding that I was sane, the College was not satisfied with this and pushed for a diagnosis of some form of mental instability as only such a label would justify how I was not fitting into their dogmatic world of compartmentalized beliefs and preventative medicine panacea – one size fits all global vaccines. Indeed, the College of Medicine went as far as stating, “Dr. Moulden must have pharmacological treatment for his delusional disorder in order for him to continue his medical practice and receive licensure.” My own lawyers took a strong stand on my behalf. In the end, it was easier to simply go along with the College and its “requests” rather than subject myself to time lost from career and training. I also learned to shut my mouth on issues of vaccination and autism. Although effectively silenced, it did not shut my curiosity, and I have continued to research my autism-vaccine model, “behind-the-scenes”, and fully intend to continue doing so provided the evidence suggests this is the right course… such is life, my father recognized this, I recognized this, and news worthy events, around-the-world, indicate, in many ways, the system is sicker than the individual. I think I would rather change the system, to help the individual, rather than change the individual, to help myself. Ron [his father] agreed with this philosophy and in many ways lived by it. Dr. Moulden was one of only few medical practitioners who have seen the bigger picture. He did not limit his awareness to mainstream medicine only. 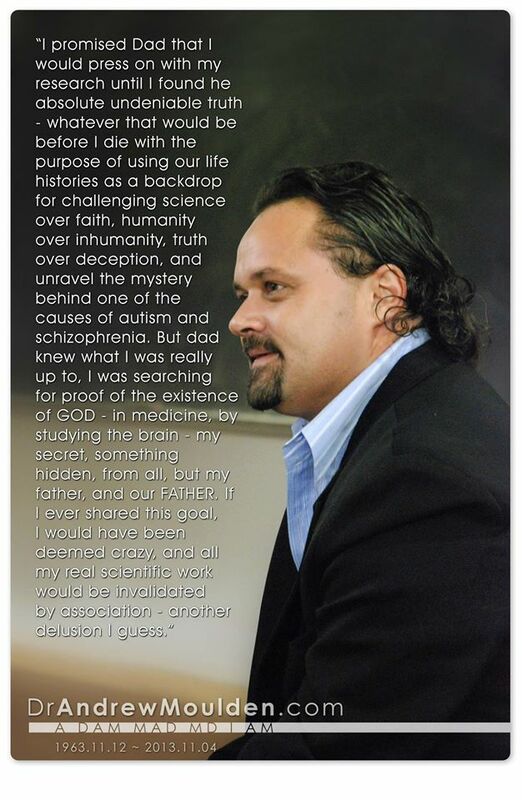 His training on neurology allowed him to fully understand the motivation behind the vaccine scam among other scams perpetrated by the entire Corporatocracy. If the government has the capacity to lie to the people it has sworn to serve and protect, we must then take it upon ourselves to know the alternative to mainstream medicine, and begin to starve the whole corrupted system by non-participation, at the very least. If a child is bit by an animal that tests positive for RABIES is it in the best interest of the child for the parent to deny them the rabies vaccine? I think some vaccines are more “important” than other ones. I prefer not doing any but really there are some that you still wonder if you should do… but then you look at the ingredients and you just don’t want to. No amount of them lying about how safe they are can cover up how toxic they are, and you are not even ingesting them to have them somewhat processed. They are bypassing every system in the body and being injected right in. Something like rabies… maybe you should get it but maybe you shouldn’t. What does the actual disease involve? That is the question to ask about ALL vaccines. Something like MMR… not needed. Knowing about the disease itself and knowing how to apply the correct nutrition will get you through it, and then your immune system will be stronger because of it.